For the Dutch Golden Age painter, see Nicolaes Pieterszoon Berchem. For Dead Man Ray album, see Berchem (album). For the town in Luxembourg, see Berchem, Luxembourg. 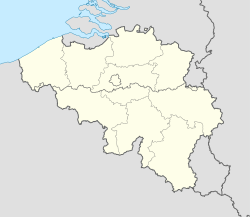 Berchem is a southern district of the municipality and city of Antwerp in the Flemish Region of Belgium. Berchem is located along the old Grote Steenweg (Dutch for 'Big Paved Road') that has connected Brussels to Antwerp for several centuries; the town borders the districts of Deurne, Borgerhout, Wilrijk and Antwerp and the municipality of Mortsel. Berchem itself consists of three quarters, Oud Berchem, Groenenhoek and Nieuw Kwartier. The 'Ring', Antwerp's circular motorway which follows the track of the former city defense walls, cuts Berchem in two parts, separating the urban inner city area of Oud-Berchem (intra muros) from the more residential and suburban areas Groenenhoek en Nieuw Kwartier (extra muros). Berchem's total surface is over 1,500 acres (6.1 km2), and it is inhabited by more than 40,000 citizens. After the decentralization of Antwerp in 2000, Berchem became a semi-independent district with its own legislative body, the so-called Districtsraad (District Council), and its own executive college. The District Council includes 25 members, directly elected for six-year terms by popular vote. The executive college comprises five Aldermen (Districtsschepenen), including a District Mayor (Districtsburgemeester), who are installed by the District Council. The Zurenborg area hosts a high concentration of Art Nouveau and other fin-de-siècle style townhouses, many built between 1894 and 1906. The main streets of interest are Cogels-Osylei, Transvaalstraat, and Waterloostraat. After the area was slated for demolition in the 1960s, to be replaced with a business and office complex, demolition was prevented when the area got monumental status in the 1980s. In recent years, the area has become an attraction for architecture-minded visitors. The Driekoningenstraat - Statiestraat is the main shopping and commercial area of Berchem. Though suffering competition from suburban shopping centers, the retail highstreet still has an interesting mix of Belgian, local, and international convenience and non-food stores. The highstreet has recently been refurbished, giving more space to pedestrians. The Groenenhoek is home to the Flemish Tram and Bus Museum. As of 2016[update] the Taiwanese airline EVA Air provides shuttle bus services to and from Amsterdam Airport Schiphol from Berchem, (near Antwerp-Berchem bus station); that way Belgium-based customers may use its flights to and from Amsterdam. The service is co-operated with Reizen Lauwers NV. The local football team is Koninklijk Berchem Sport. See the Category:People from Berchem. ^ "Between Belgium and Amsterdam Airport." EVA Air. Retrieved on February 29, 2016. This page was last edited on 11 April 2019, at 12:57 (UTC).